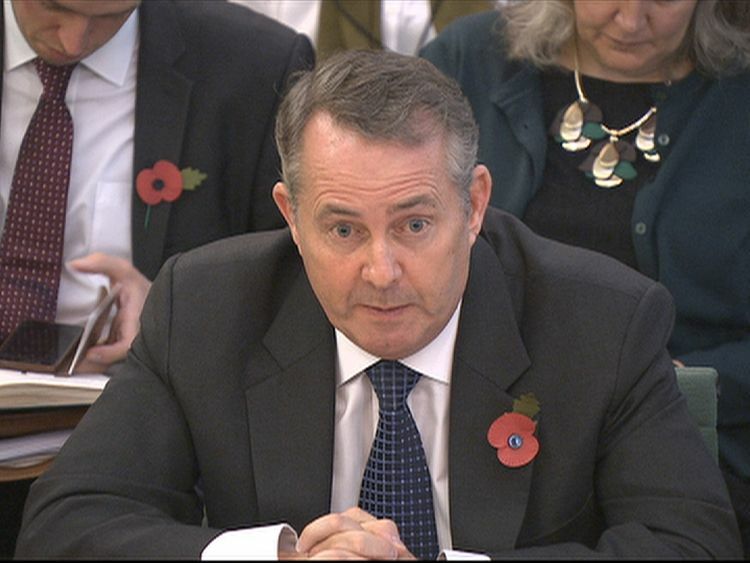 Britons should not be afraid of eating chlorinated chicken imported under a post-Brexit trade deal with the US, Liam Fox has said. The International Trade Secretary insisted there are "no health reasons" why UK consumers should not enjoy chlorine-washed meat, if regulations on food produce are relaxed once Britain leaves the EU. Dr Fox has made striking a trade deal with the US one of his first priorities when ministers gain control of UK trade policy outside the EU.But this has led to fears British supermarkets will be flooded with goods produced using American farming practices, which often include methods banned by the EU.Appearing before the House of Commons' International Trade Committee, Dr Fox was asked by Tory MP and fellow Brexit supporter Nigel Evans about concerns over US-produced chicken. "There are no health reasons why you couldn't eat chicken that had been washed in chlorinated water," Dr Fox said. "Most of the salads in our supermarkets are rinsed in chlorinated water. "In terms of reduction of campylobacter bacteria food poisoning, the US has - in general - much lower levels of campylobacter food poisoning than most countries in Europe. "He added: "I have no objection to the British public being sold anything that is safe as long as they know what they are eating. "I'm a great believer in giving the British public the choice over what they eat and as long as scientists tell us it's safe, then I think that should be our guiding principle." Pressed on whether UK tourists should avoid eating chicken when they travel to the US, Dr Fox replied: "No." The Cabinet minister denied Britain is desperate for a trade deal with the US, insisting the Government would reject any agreement that was not in the UK's interests. "If we were offered a deal we didn't think was to our advantage, we wouldn't take it, it wouldn't be a deal," he said.Earlier this year, it was reported the issue of whether to include agriculture in a possible post-Brexit trade deal with the US was the subject of a Cabinet rift.Environment Secretary Michael Gove has previously ruled out allowing US-produced chicken into Britain, as he insisted agricultural standards would not be reduced after Brexit.In his committee appearance, Dr Fox also accused the EU of acting like a "gang" over Brexit negotiations, suggesting an exit agreement that moved away from the current UK-EU relationship would be a "political" choice.He said: "The language, which is regrettable, that some people want to punish Britain for leaving in case any other people would want to leave is the language of a gang and not the language of a club. "In the longer-term it's in the interests of all EU citizens to maintain an open, liberal trading environment. "Commenting on Dr Fox's committee appearance, Labour MP Chris Leslie - a supporter of the pro-EU Open Britain campaign - accused the Brexit supporter of being "disgracefully complacent about the prospect of a deal with the US leading to a flood of chlorinated chicken invading our supermarkets".